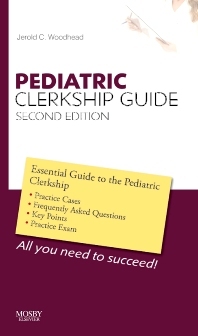 Here's all the help you need to survive your pediatric clerkship! This handy guide offers you practical, must-have guidance on the causes, clinical evaluation, and treatment of common pediatric conditions—knowledge that every student can and should master. Section 1 outlines the practical skills and procedures you must know on rotation; Sections 2 and 3 describe health conditions organized by presentation (symptom, sign, abnormal lab value) and by specific diagnosis, allowing you to approach a given health problem from either direction. Organizes material according to the types of questions that you will typically ask during the clerkship. Uses Learning Objectives and Key Points boxes to make complex data easier to remember. Provides Cases to illustrate the types of clinical scenarios you may experience. Includes a multiple-choice exam at the end of the book to help you prepare for clinical exams.